On Saturday it was officially announced that Jim and Sue Houghton, founders, chair and development officer of Sport in Desford have each been awarded a British Empire Medal for services to sport in the Queens Birthday honors list. Sue and Jim Houghton who won the BBC Sport’s 2012 Unsung Hero Award have spent 30 years transforming a derelict Leicestershire airfield into a popular community facility. 30 years ago Desford had one football pitch and a run down squash court. Now it has 3 tennis courts, 3 football pitches, a bowling green, 2 squash courts, a gym which runs an exercise referral and heart smart programme, Dance Studio and a large hall which is used by the local beavers, Cubs and Scouts and football changing rooms spread over two sites in Desford. It is now a successful charity attracting over 900 visits a week. Jim and Sue have also had the foresight to ensure that the facility is sustainable by submitting funding bids for 176 solar panels and in doing so making SID electricity neutral and using the feedback tariff to ensure that SID has a sinking fund. SID is a model of good practice in how to build up an outstanding community sports facility through sheer commitment, hard work and an ability to inspire the community. An excellent example of this is the establishing of Sport in Desford Lawn Tennis Club, over the past seven years the club have grown to have over 150 members, delivering sessions for older people, special needs groups and for people affected by cancer. Stage by stage Jim has been able to support the clubs development plan by accessing funding examples of which include building a third court to meet the demand and in April 2015 moving an old car port, which was the club house, and building a new purpose built tennis clubhouse. To support the club get established Sue has chaired the club and guided its growth and more importantly supported the junior section, which is growing year on year, and will be the future of the club. However, while Jim and Sue have spent many hours building and developing SID they do not keep all their knowledge to themselves. They both tirelessly support other clubs and groups sharing successful funding streams and their knowledge which they have built up at SID to help other clubs across Leicestershire. 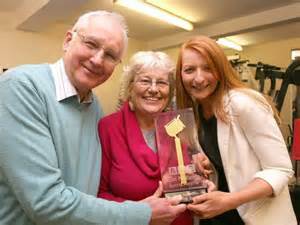 Jim and Sue are great supporters of sport in the borough and county, promoting and encouraging participation. Sue is a parish councillor on Desford Parish Council, chairs the local sport and health alliance, sits on the Board of the County Sports Partnership and is a member of the borough health and wellbeing partnership happy to share her knowledge and support many initiatives in the borough. Jim supports local community groups submit successful inspired funding bids by sharing his knowledge at Club Coach evenings as well as selflessly giving up his time to support other groups.